AAS are Northamptonshire’s TV aerial installation experts. We can upgrade and install a range of TV aerials including Freeview, BT Vision and Youview. Why Have A New TV Aerial Installed? There are many reasons to have a new TV aerial installed. Many people choose to have an aerial installed to move away from pay monthly satellite TV subscriptions. Others have their aerial replaced to achieve a stronger reception, or simply to replace a broken TV aerial. Book online or call today on 0800 612 5032 or 07989 679907 to speak with an engineer directly. Why Choose Advanced Aerial Services? AAS have been working across Northamptonshire for over 20 years. This experience gives us a solid knowledge of the local TV signal reception, allowing us to offer sound advice to help you choose the right TV aerial. As well as our years of experience, we’re also an RDI approved installer, trading standards approved and we also boast over 1200 reviews on Checkatrade. At AAS we are pleased to offer special height installations. We are Health and Safety Executive certified to work at height, having attended training courses backed by the Confederation of Aerial Industries. This means that we can complete installations at heights that other TV aerial companies won’t cover. 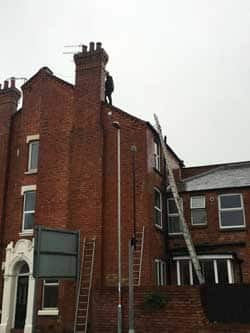 We have also obtained City & Guilds and NVQ qualifications, which ensures the job is done safely by competent aerial installers and that your building is undamaged. We carry ladders on the van to reach up to 4 stories, but longer ladders are available on request. Larger properties normally have roof access but cherry pickers can be arranged if this is not the case. AAS can install additional TV points in your home. We understand that not all of us want to watch the same channel, and so having extra TV points are a simple way and often a cost effective solution to having extra televisions throughout the house. Whether you want an additional TV point adding to a second lounge, or you want to be able to watch TV in your kitchen or bedroom, we can help. Book online today or call us to speak with an engineer directly and we can arrange a free survey and quotation. Call the team on 01933 315 393 today.